We have been scouting for Bagrada bug on wild host plants at two sites in the San Ardo area since middle of May. We selected San Ardo as our most southern scouting point for the Salinas Valley. Every other week, we have performed plant visual counts and collected yellow sticky cards to document the presence of these bugs. So far, we have not found any Bagrada bug in the San Ardo area. Four additional sites, along Highway 101, were added today to the Bagrada bug scouting route. These sites, from south to north, are located: 1) near King City, 2) south of Greenfield, 3) south of Soledad, and 4) north of Soledad. Today, we were able to document the presence of Bagrada bug adults (Fig. 1), on shortpod mustard (Fig. 2), in two of the four additional scouting sites. 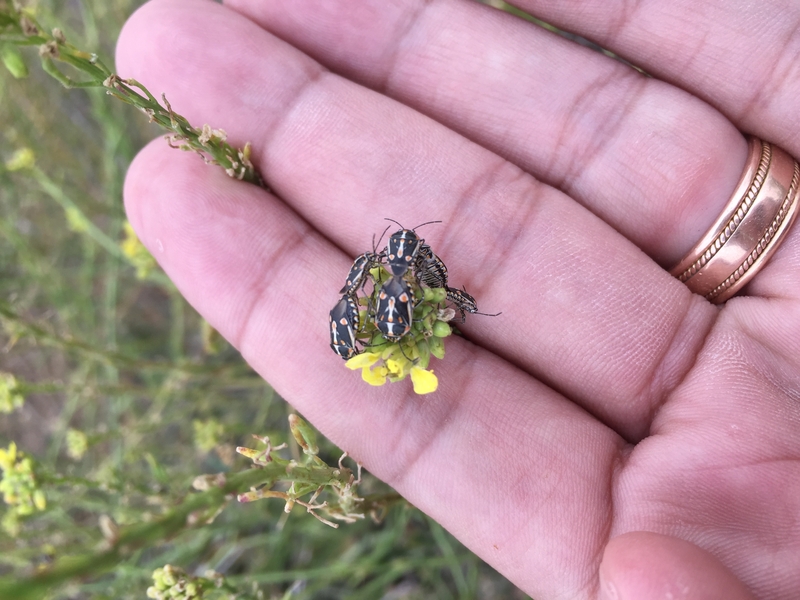 Bagrada bug adults are currently located north of Soledad and near King City. From our observations, there are no nymphs nor eggs on the shortpod mustard. Adults were observed mostly mating. Early instar nymphs will be expected in the next couple of weeks. We will be increasing the frequency of the scouting for this bug to weekly visits, and we will be adding two additional sites near Gonzales, one in Chualar, and another one south of Salinas. Adding more sites will help to document if Bagrada bugs are present in other places besides Soledad and King City. Are these bugs isolated and resident Bagrada populations? We plan to answer this question setting up more scouting sites across the Salinas Valley. 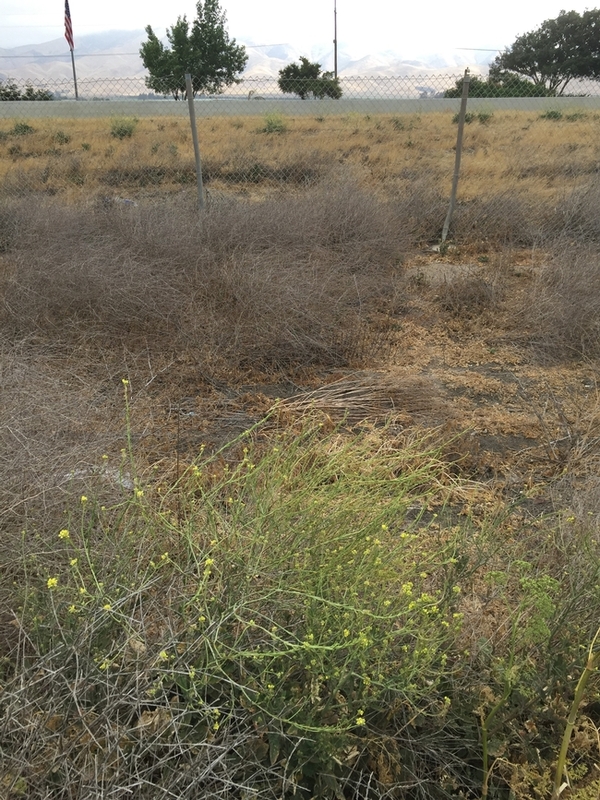 Today, we also noticed that the most of the shortpod mustard plants are senescing. It would be expected that Bagrada bug females might disperse from unsuitable wild host plants to recently planted cole crops in the surrounding areas. Dispersing and mated females may lay their eggs on these crops. I would suggest to PCAs to check recently planted or young cole crops in the surrounding areas of Soledad and King City during this week. Early detection of potentially migrating females will help everybody to successfully manage this pest. We will continue to visit our scouting sites for Bagrada bug in the Salinas Valley. If you have any further question about the situation of this pest in your area, please call or email Alejandro Del-Pozo at 831-759-7359 or adelpozo@ucanr.edu.